At least 15 years ago, I found one of my favorite articles of clothing. It’s a zip-up pair of footie pajamas. No – not for the kids or the babies – but for me. Now, I know these have become all the rage now, but they weren’t 15 years ago. And I had a pair. They get quite hot and I don’t wear them all that often, but during the recent snow storm in Israel, I don’t believe I was seen without them. Eyeing me with envy, four of my boys kept asking where I got them…and could I maybe, possibly find some for them. And so my idea was hatched. One day, as we sat inside huddling together after playing in the snow, I started my search for big boy footie pajamas. They have them all over the internet, but they are quite expensive. I managed to secure pairs for the four middle guys. Matan was proving more difficult. He’s tall enough now that he needs an adult size, but most of the companies that sell these prized items do so for no less than $50. And then I stumbled upon the prize. 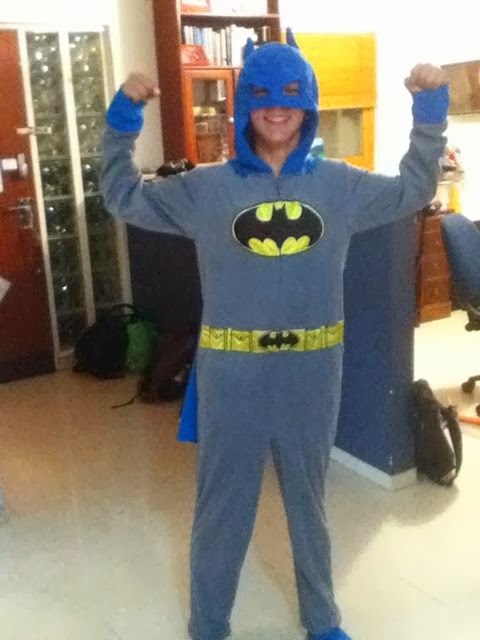 I found Batman footie pajamas that came with the cape, the mask…the whole nine yards. And Josh was right. We gave them to all of the boys last night and they all ran downstairs to take their baths so that they could get into their new pajamas. Matan came home when everyone else was already snuggled into their pajamas. He glanced at his set, and ran downstairs to shower, hours before he normally would. 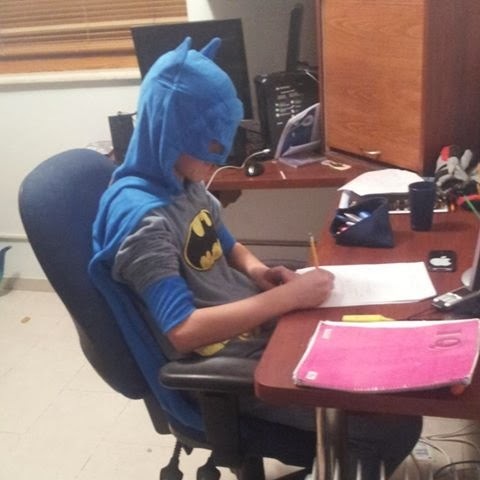 And then he reappeared, with his mask on, his cape flying behind him and his stance proudly showing that he was Batman. He loved them. And he proceeded to have us take pictures so that he could post them on Facebook. The only surprising turn of events was that Yakir started screaming at Matan to take off the pajamas. Apparently he owns the right to all superhero pajama sets, and he was horrified to see his brother wearing something that most certainly must have been his. It took a while to calm him, but he finally settled back down with the promise that he could wear his superman pajamas the next day. I know my boys are growing up and that Matan will soon (maybe?) turn away from these types of activities. But it certainly still brings me great pleasure to see them so excited about the little things in life…and enjoying the pure thrill of a cozy pair of footie pajamas on a cold winter night. Batman and all. I tried to get the whole gang together for a picture, but have you ever tried to coordinate six sons and their pajamas? So here are a few of them…we’ll get the bigger picture at some point!